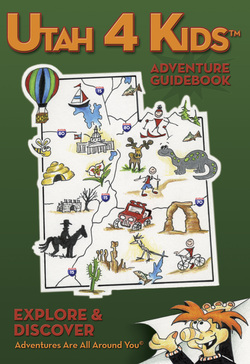 Yes, you can order your very own Utah 4 Kids Adventure Guidebook on Amazon. and order your book today! Do you want to be an awesome uncle? Are you visiting from out of state with your children? Not sure what to do with the kids this weekend in Utah? ...then ORDER YOUR Utah 4 Kids Adventure Guidebook TODAY! Fun Utah for kid activities statewide. What a deal! This Utah kid's pocket travel guidebook fits great into your backpacks, purse, or even your back pocket. At only 4 inches by 6 inches in size and 224-pages, it's jammed pack full of fun activities, small enough to fit in your pocket, but big enough to fill your life with adventure. Imagine this... amazing Utah kid activities for every weekend of the year at your fingertips. and get your Utah 4 Kids Adventure Travel Guidebook TODAY! We do appreciate any direction on how we can best serve you.